You’re probably not going to believe this, but we’ve been trying to cut back on our sugar intake ever so slightly. I could never give it up all the way, but after reading this NY Times article on the toxicity of white sugar, Taste Tester decided to make some changes. One of which was to give up cereal. Cereal- also known as my go-to breakfast for pretty much my entire existence. Seriously? I thought he was crazy. Crazy, I tell ya! But after some initial resistance, I consumed the last of my cereal stash and I too, have stopped eating it. It made sense, really since most dry cereals are shockingly loaded with sugar and never kept me full til lunch anyway. Life has been better since giving them up with one minor problem… what the heck do we eat for breakfast now?? There are plenty of options, but cereal was just so… easy. :-/ It produced 1 bowl and 1 utensil of dirty dishes; no prep work required. Eggs use a pan, oatmeal uses a pot… both take time… what to do? We spent a month in Austin last winter, during which I near-stalked a local smoothie joint and discovered the magic of smoothies and fresh juices. I had never paid much attention to them before but wow, did I feel better after drinking one! So instead of using up our bananas to make banana bread like usual, I tried making a smoothie for Taste Tester. 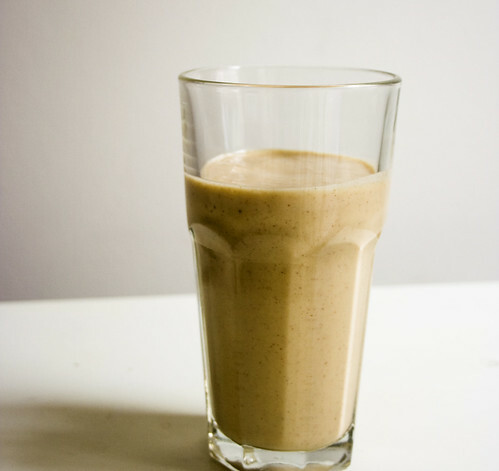 I blended banana, reduced-fat milk, peanut butter, honey and cinnamon. He said it tasted really good, but there was one problem: it was warm, not chilled like a smoothie should be. I tried putting it in the freezer for a few minutes, but the edges of the drink just froze. Clearly, I am a newbie at this. So, the next time we bought bananas, I waited for them to get ripe, chopped them up and froze them individually, so I had 5 ready-to-go chopped bananas that could just get thrown in the blender for 5 easy breakfasts. It worked like a charm- they produced tasty, chilled breakfast smoothies that Taste Tester loves. Yay! This may not be a solution to the dirty dish problem since you need to use a blender, but it is a solution to the healthy/filling/non-time consuming problems. Plus, now that I make them so often I can just eyeball the measurements so I don’t have to waste a bunch of measuring spoons and whatnot. 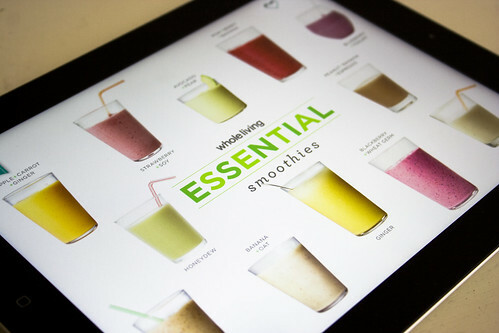 On the same smoothie-loving note, now that we are no longer in Austin near my go-to smoothie place, I discovered this stylish iPad App that will keep me stocked and busy with smoothie recipes! Super fun. 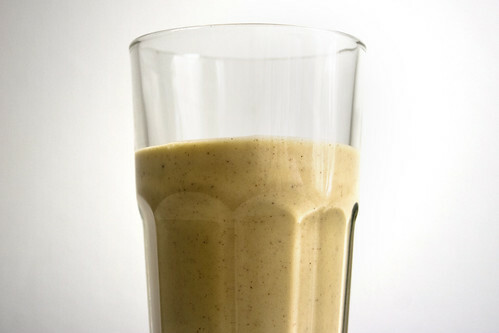 Add all ingredients to a blender and puree until smooth, about 30 seconds. Pour and enjoy! With a semester of smoothies-for-breakfast everyday under my belt, I have to say they are a great way to start the day! I can make a loaded smoothie in less than 15 minutes. I’ll have to try this one out!